This article is really geared more to my fellow independent beauty professionals out there. I belong to a lot of forums on social media filled with many types of industry professionals, and in the hair world, the diversion topic is almost brought up daily. What I have realized, is that there is a lot of information out there about this topic, but many aren’t really understanding the big picture. Things are changing fast, and it is time for you to take action. All of you have the power and choice to do it! So let’s go back to 1994, when I first entered the industry professionally. There were brands that marketed to professionals as “Professional Brands”. We learn in cosmetology school, and in classes offered by these manufacturers that there is a difference in quality. They are made with better ingredients, are more concentrated, etc. And honestly, there was and still is in a lot of instances. So if there are any consumers that are curious, and reading this article, if you are investing in getting an amazing color, please use the products that your stylist is recommending. It will keep your color more vibrant, it will last longer, and honestly these are just some of the reasons. I think I’ll have to write another post about that subject! But right now, I have to stay on subject here!! Yes, I believe that diversion is happening, and I’m going to address that now, but please read on until the end because I don’t think it can all be blamed on that. So here are some things to think about. I can remember back in the 90’s, the salon I woked at carried Nexxus, and at the time this was a salon only product. One of our customers informed us that she saw it over across the street at one of the big box stores. We actually had a hard time believing her! At the time, this was not something happening. When our Nexxus Rep came in, we informed him of this and he actually went and bought every single product off the shelves trying to get it out of there. Yes, I’m, dating myself, but honestly, this was the start of diversion in my career! As the years went by, more and more professional lines started showing up in more and more stores and now with the internet, it’s a whole new ballgame. 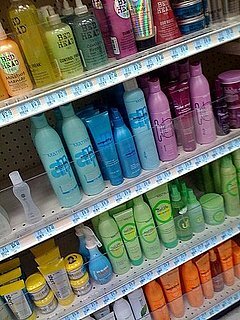 Diverted products can be counterfeit, diluted formulas, or old, expired formulas that may not be safe to use. Matrix states on all its advertising, “Genuine Products Guaranteed Only In Salons.” This means if you buy our products in a supermarket, drugstore or any other outlet other than a salon or authorized salon related websites, we cannot guarantee that it is an authentic Matrix product that will perform as tested. Additionally, Matrix products sold outside of salons are typically priced 15% or more than in a salon. – A former FBI agent developed the strategies and oversees the implementation of Matrix’s anti-diversion program. – Exclusive product coding is used to track the movement of Matrix products. This is the method for tracing products to industry diverters. – We’ve terminated over 3,000 diverters and are tracking diverted products with our secondary coding system. – We’ve installed a new Quality Guarantee Policy exclusively for salon purchases. – Matrix representatives undertake regular sample buys at unauthorized retail outlets in the U.S. These products are subsequently decoded in an effort to identify diverters. – Ongoing intelligence procedures uncover diversion schemes, including those involving stores and misuse of the Internet. Brands came out with videos, contracts, campaigns, all sorts of things. They also have taught us to educate our clients, about diversion, which I know many of you have done for years, but I’m going to be point blank from this point out! Most customers don’t care, they will go buy it else where! Not everyone will, but most will. We, as professionals have helped brand these products, and have taught our clients the importance behind them, and the proper way to use them. But when a client is at Target, and they see their product, they buy it! I would educate my clients that it’s not cheaper, in fact I even would price match at the beginning, but now in so many instances, they are being offered cheaper at the store than I can get them for. I would educate them on the fact they could be counterfeit, expired, watered down, etc., etc., etc., until I was blue in the face! So, what I want you to really understand is what else has happened behind the scenes over the years, and want you to think about it in this perspective. Who really owns what. Do you know the top beauty brands in the world in order? Animal testing: The Estée Lauder Companies Inc. writes on its website that the company conducts animal testing on products and ingredients when required by law. The company is listed on PETA’s companies that “either test on animals or pay a laboratory to conduct tests on animals” list. • Kéraskin Esthetics, created by L’Oreal in 2007 and specializing in skin care professionals. • Matrix Essentials, founded by Arnie Miller in 1980 and acquired by L’Oreal in 2000. • Mizani, founded in 1991 and bought by L’Oreal in 2001. • PureOlogy Research, founded in 2001 and acquired by L’Oreal in 2007. • Redken 5th Avenue NYC, founded by Paula Kent and Jheri Redding in 1960 and acquired by L’Oreal in 1993. I couldn’t list all of the companies and their brands, but you can look them up if you want. What I want you to realize is, even though some of the professional brands were once small, independent companies, so many of them have been bought up by these billion dollar companies that own mostly consumer brands. Not only have the ingredients changed, but in some case the quality. Many of them aren’t providing the same education to us. They spend millions of dollars marketing to YOUR clients. So are they still “Professional Only Brands”? I remember, I was once told in a salon marketing class, that as long as I was going to support these companies with my purchases, I was continuing to allow them to do this. That really stuck with me. Think about it with hair color and other salon supplies too. Who are you really paying? I was a Schwarzkopf Professional Master Colorist for years. I know their color line inside and out. Not only did I use their color line, I also used all of their hair care products on my clients. But, now they are marketing their consumer hair color line in Walmart. I would never advise anyone to color their own hair. We all have been in there. We are the ones they come to when they need it fixed! Nothing will replace the experience and knowledge that we have. We know what can go wrong, but the consumer sees the brand and will trust it. It’s all about branding, so yes, they are now marketing to my client. Whatever the case is, you as a independent professional have a choice. You can choose to recommend brands that aren’t found down the street at Ulta or TJ Maxx, or you have the choice to keep the sale. Retailing is a huge part of our income. It’s time to take it back! If you want to continue to grow as an independent professional, or salon owner, you need to start to evolve. Ask yourself, what makes you different? Why would customers want to come to you? What do you offer that other salons don’t? There are so many things that you can do. I will be doing some Facebook broadcasts and more Blog posts to teach others what I have learned over the course of my career. So make sure you follow me!! Being in the industry 21 years and owning a salon for 11. I guess I feel there’s a lot I can offer! I’d love to hear your comments and questions! So what do you think? Are major professional brands realizing they can make more money by selling directly to the consumer?